I don't know about you, but I watch Spike TV. Whenever I happen to have a day home from work (for some reason), I watch Star Trek reruns on Spike. It's something I do. Spike is also good for a 007 movie on a regular basis. It's consistent. I like that in a TV station. 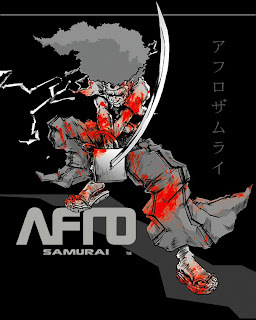 Well, folkz, I'm happy to announce a NEW reason to watch Spike TV: Afro Samurai. "Did he say 'Afro Samurai'??" Yes I did. Never thought you'd hear(see) those two words together, huh? Believe it. Let me break it down for you. Afro Samurai is an animated (yes, animated) show about...a Samurai with an afro. The premise is there are these two headbands: The #1, and the #2. The represent the #1 and #2 fighter/warrior/badasses in the whole world. The catch is, only the #2 can challenge the #1. Who can challenge the #2? Anybody who damn well pleases. The current #2 is the Afro Samurai. His father was the previous #1. As a young boy, he was forced to stand by while his father was killed by some dude that fights with pistols. Ever since then, he has been on a mission to avenge his father's death. At the same time, he has to take on anyone who crosses his path that wants their shot at becoming #2. This dude Afro is cold-blooded. The whole series is very bloody, and graphic. Almost told in Japanese anime style, if you've had any experiences with that. Here's the clincher, what makes the show worth watching, and what makes the show worth mentioned here at "Know What I'm Sayin'?? ": Guess who voices Afro. Guess. Just guess. You'll never guess. I'll just tell you. That alone makes the show like 10 zillion times better. Want the double clincher? Not only does Sam voice the cool, calm, even stoic Afro. He also voices "Ninja Ninja". I have yet to figure out whether NN is an actual person, or just Afro's alter ego. He's always there, but he never does anything. It's like he says the things that Afro might be thinking if he had grown up in the hood. The dichotomy between the two is interesting. It's like Afro is a calmer, quieter, impassive version of Jules Winnfield from Pulp Fiction, while NN is like a less-high, but still excitable version of Gator from Jungle Fever. I'm pretty sure he's just an alter ego. Yeah. That's it. I was just researching this on Wikipedia, and it turns out that Afro Samurai only currently is slated for 5 episodes. The bad news: They're already through Episode 3. The better news: As of today, you can catch Episode 3 at SpikeTV.com. The not so great news: They only host one episode at a time, so get it while it's hot. The details: Airs on Spike TV at least the next couple of Thursdays at 11pm. This cartoon is not for your kids, people. This is DEEP into prime time TV. By the way: The RZA produced the score, which should be released next Tuesday. Okay, that was one of the best posts I've ever read. Afro Samurai? What? 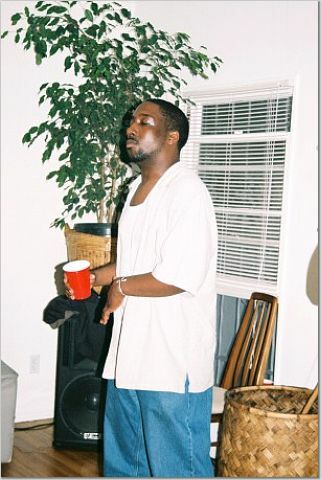 Say it one mo' 'gin. Afro Samurai! By Samuel Jackson. First Snakes on a Plane, now this. Why Sammy, why?! For real, though, Afro Samurai sounds like the best storyline ever. And the most original. This whole new thing of avenging your father's death, that is VISIONARY!